On Sunday October 1, 2000, the Pirates bid farwell to Three Rivers Stadium, ending a 30 year residence in a ballpark that has played host to some of baseball's greatest memories. For a limited time only, Lanny Frattare Scorecards is offering you an incredible piece of sports memorabilia. A reproduction of Lanny Frattare's final scorecard from Three Rivers Stadium! 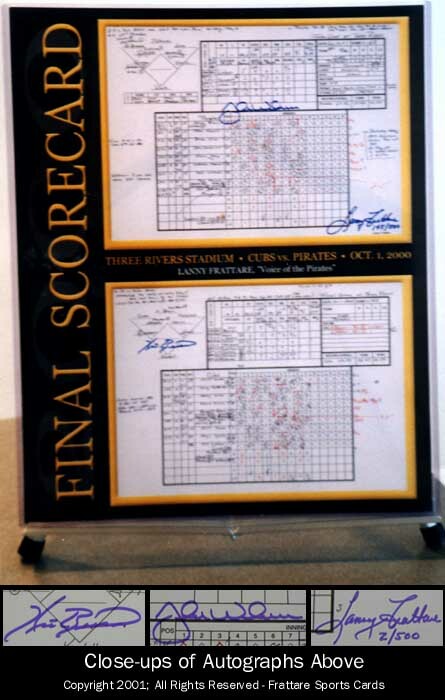 This reproduction of both sides of Lanny's scorecard from Game #162 on October 1, 2000 also contains the authentic signatures of Frattare, final Pirates pitcher Kris Benson and Pittsburgh native John Wehner, whose home run was the final one at the ballpark. Only 500 of these scorecards will be produced and each hand numbered reproduction comes with a Certificate of Authenticity. Why "Kiss It Goodbye" when you can own a piece of Three Rivers history for only $30.00. Lanny Frattare Scorecards is not affiliated with the Pittsburgh Pirates Baseball club. Copyright © 2006; All Rights Reserved.